This post is sponsored by BabbleBoxx.com on behalf of Alexia. As always, all opinions are my own. I must have been the last person in the world to discover how absolutely delicious and weeknight-perfect chicken thighs are. Sorry, everyone. I was behind the curve, but no more! I’ve fallen in love with chicken thighs so much, that today I’m sharing not one, but TWO easy, weeknight-friendly chicken thigh recipes, along with some suggestions for sides from Alexia to round out your meal, without weighing you down. 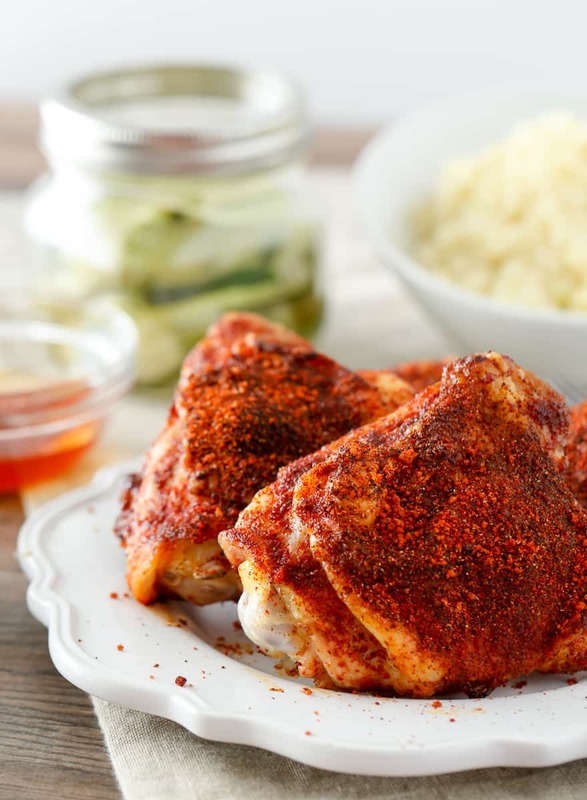 Healthier Baked Nashville Hot Chicken – look at those spices, y’all! All the heart eye emojis! First, a little hot and spicy ( okay a LOT hot and spicy ), lightened up, Baked Nashville Hot Chicken. I cook dinner almost every night, but even when I keep the recipes easy, it can still be exhausting. 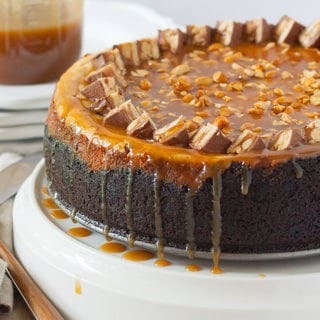 I always recommend to my friends that they pick ONE thing to put their effort into, and for me, that is almost always a main dish. Here’s the thing though, you shouldn’t make some killer main dish, like oh, say, mind-blowingly good baked Nashville Hot Chicken, and then slop something random next to it. Instead, look for a premium side dish that is on par with that main dish you made – something that is easy, but still uses the same high-quality ingredients you use in your own kitchen. That’s one of the reasons I love pairing my mains with Alexia – they use organic dairy, creative flavors, but are stupid easy to make. SOLD. With my Baked Nashville Hot Chicken, I love pairing something nice and creamy to round out the heat, like Alexia’s all-Natural White Cheddar Riced Cauliflower with Black Pepper, along with a quick pickle made by tossing some ribbons of cucumber into boiling vinegar with salt, pepper, and garlic for just a few minutes before serving. Of course, maybe eating something so hot it should come with a warning label isn’t really your style? Or, maybe you’re looking for more than just a weeknight dinner? Don’t worry, there’s a chicken thigh for that, too! On the nights when I want to feel more “elegant” than “lightened up fancy picnic”, I reach for the prosciutto and sage. These two simple ingredients add such a wonderful combination of salty and woodsy, herbal flavor to the chicken thighs, and you guessed it — I think they deserve something really special next to them. 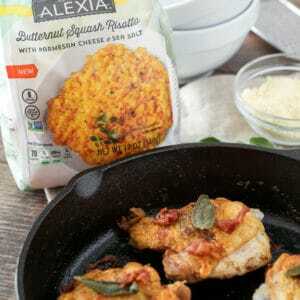 Cue Alexia’s Butternut Squash Risotto. Creamy, rich, but somehow low-carb, it takes practically zero effort ( and literally zero outside ingredients ) to cook. In less than ten minutes of hands on time, you can make crispy prosciutto and sage chicken thighs with a fancy vegetable side dish that will taste like you slaved over it. Sounds like dinner is done. 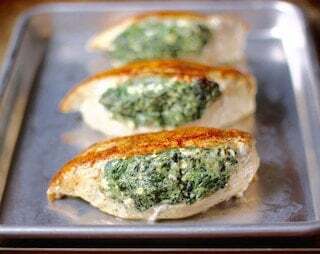 Place a greased oven-safe cooling rack on top of a sheet pan. ( Cooking spray is a fine way to grease a cooling rack ). Combine all spices in a small bowl. Pat the chicken thighs dry, and then rub half of the spice mixture all over them. Place on the prepared cooling rack/sheetpan, and place in the oven. Bake for approximately 50 minutes, or until the skin is crispy and the chicken is cooked through. Sprinkle with the dry spice mix as soon as it comes out of the oven, and serve. For the Prosciutto Sage Chicken, you won’t believe how easy this is! Simply preheat the oven to 400 degrees F. Pat the chicken dry, season with 1/2 teaspoon salt and 1/2 teaspoon pepper, and then cook in 1 tablespoon of olive oil in a skillet over medium heat for ten minutes. Flip the thighs over, add four whole sage leaves and four chopped slices of prosciutto to the pan, and bake in the oven for approximately 15 more minutes, or until chicken is done.